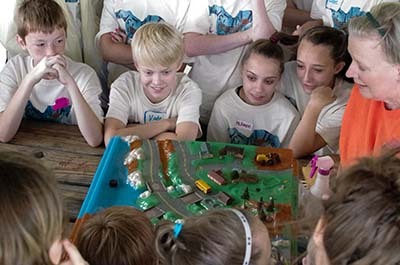 Kids in the Creek was created by the Tennessee Valley Authority and brought to Haywood County in 1997. The purpose is to expose 8th grade students to hands-on activities that raise awareness of the importance of clean water and the issues that could degrade water quality. The students rotate among four stations: the EnviroScape watershed model, water chemistry, fish, and benthic macroinvertebrates. 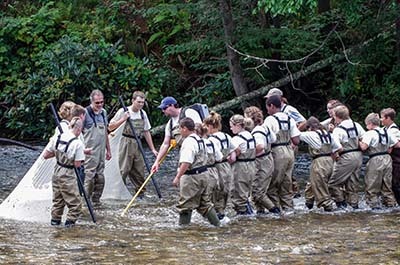 At the fish station, the students collect data for a classroom exercise that ties everything together. 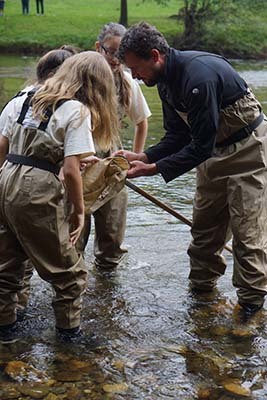 "Having been an 8th grade science teacher for many years, I can attest to the importance of "hands-on" experiences when teaching science concepts…This does more to increase their understanding of water and water quality than anything that I could do in the classroom. Kids in the Creek has been a valuable learning tool for many years and something the students and I looked forward to every year." 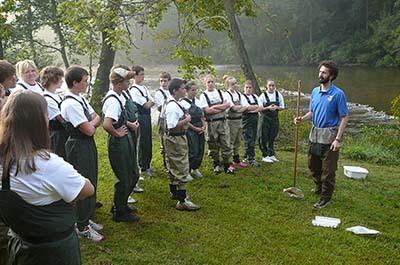 "…because students have attended Kids in the Creek we are able to use it as background knowledge, and when discussing a topic such as nitrates, students can refer back to the experience. 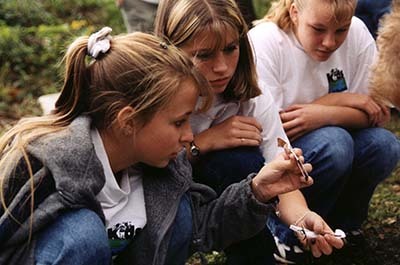 Because of attending Kids in the Creek, topics that can be too abstract for students are made easy to understand through real-life examples in their own backyard." As part of the Kids in the Creek experience each student receives a t-shirt. In 2010, Haywood Waterways started a contest where the current year participants have an opportunity to design the front of next year's t-shirt. This has proven to be a popular and fun activity that has even led to life-changing experiences for the winners. Partnerships have been critical for the success of Kids in the Creek. Each year we assemble a volunteer army from a variety of places: Haywood County Schools, the Towns of Canton, Clyde, and Waynesville, Evergreen Packaging, Haywood Community College, Haywood Cooperative Extension Service, Haywood Soil & Water Conservation District, National Park Service-Great Smoky Mountains National Park, NC Division of Water Resources, NC Wildlife Resources Commission, Tennessee Valley Authority, Trout Unlimited-Cataloochee Chapter, University of Tennessee-Knoxville, US Fish & Wildlife Service, and interested citizens. Kids in the Creek couldn't happen without financial support either. The Pigeon River Fund of the Community Foundation of Western North Carolina has been the primary funder, but we've also received support from Waynesville Kiwanis Club, Waynesville Rotary Club, private donations, and our new and highly popular fundraising event – the Polar Plunge. If you participated in the Kids in the Creek program, WE NEED YOUR HELP! Please take this brief survey (link, to be created) and let us know how Kids in the Creek affected your life. This is critical information for helping us acquire grants and seek donations to continue our youth education programs, including Kids in the Creek.